Close by the front line, two soldiers and a sergeant have come to bury fallen comrades, in an opening scene with just the faintest echo of Yorick and a blues soundtrack. As the grave-diggers prepare to throw on the soil, the wrapped and stinking corpses start to squirm and mumble; in a spellbinding moment, Keeran Blessie, as the soldier Driscoll, sits up from the grave. Six soldiers simply refuse to be buried, precipitating a crisis in the war machine. The director Rafaella Marcus gathers a big, close-up cast of 11 within the tiny Finborough and places the action around a soil-filled burial ground about the size of a vegetable patch. In this bold and forthright production, dark satire segues into relationship drama; deft character changes underline how the dead are merged with the living. 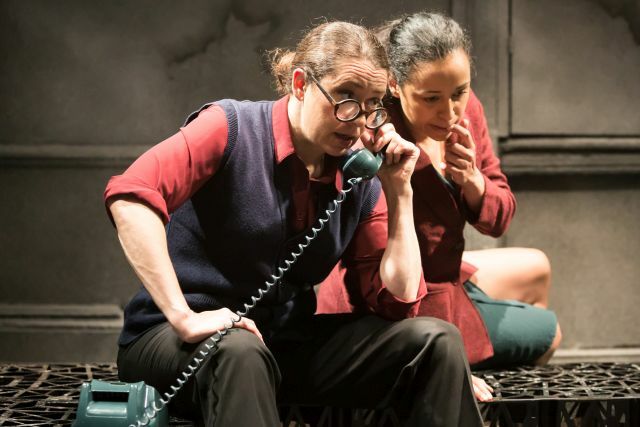 The two women in the company (pictured above) deliver stand-out multiple performances. Natalie Winsor is thoroughly persuasive in five quick-changing roles from journalist and prostitute to mourning mother and sister, while Sioned Jones through half-a-dozen roles delivers the coup de grace to the plot, upbraiding her mechanic husband, a sergeant played by Scott Westwood. Bury the Dead has a keen fascination as a historical document, and Marcus's staging offers the clarity and space it needs for reflection. Here's an anti-war expressionist play, whose author was only five when World War One ended, recalling the American experience of a conflict that is mostly remembered as a European affair. The Americans suffered far less than we did, their troops arriving only during the last year. Did they keep their jingoism intact? And what did Shaw know about war and its horror and loss? One can't help but reflect on how audiences received the play in its day (it was an instant hit) and what was shaping attitudes to the Great War as well as Shaw's early writing. The Good Soldier Schweik, the Czech film of the satirical war novel by Jaroslav Hašek, had come out in 1931, preceded by All Quiet on the Western Front and Robert Graves's Goodbye to All That in 1929, not to mention the writings of Wilfred Owen and Siegfried Sassoon. This piece, in turn, is a dark surreal satire, targeting the priests, the propagandistic newspapers and, above all, the officer class. Simon Balfour's general is a smiling authoritarian who reaches in the end for his machine gun, while his colleague (played by Malcolm Ward) indignantly insists that these corpses must do their patriotic duty for the love of America (the accents here are broad American, but mostly not jarring). The Captain, a moral interlocutor strongly played by Guy Warren-Thomas, is enlisted to persuade them via philosophical discussion, as the dead regain their voices and ask to hear a song – movingly provided by Liam Harkins (pictured above with Luke Dale and Scott Westwood). 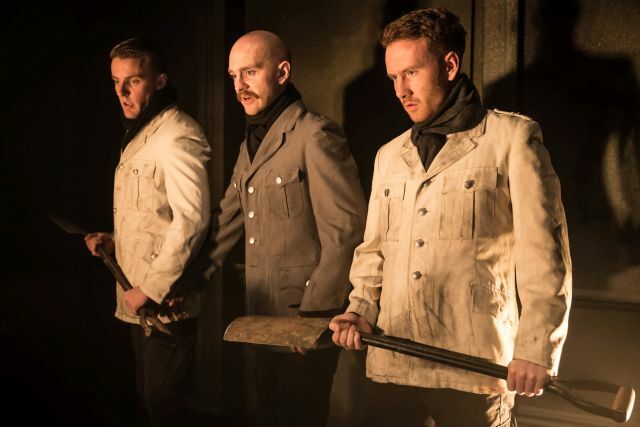 The play is a little like war poetry on stage, portraying the sense of a conflict where the line between the living and the dead is being blurred by the scythe of death on the front line. Wilfred Owen's poem Strange Meeting comes to mind in its underground encounter with the dead soldier mourning the "undone years". The dead are morally superior to the living in this night of the living GIs: they call out false patriotism and ask the generals how they'd like to have died at 20, after years just practising to be a man. "Maybe there's too many of us underground now," says one with ringing finality: "Maybe the earth can't stand it anymore."